We aim to make SEMrush an integral tool for online marketers. 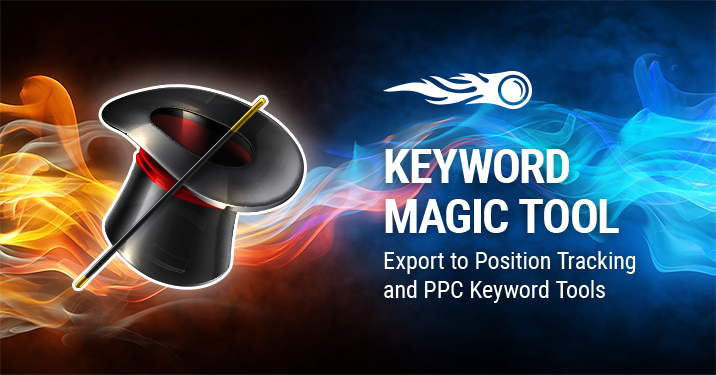 That’s why this time we have embedded the Keyword Analyzer export from the Keyword Magic tool into the Position Tracking and PPC Keyword tools. In this way, we’ve simplified the keywords analytics work for SEO and PPC specialists’ convenience, so they can select and gather keywords in one tool and continue working with them easily and freely directly in other SEMrush tools depending on their goals and needs. How can you export keywords into the Position Tracking and PPC Keyword tools? Take note that it’s only possible to export data into a running project, so be sure you have an active project in both the Position Tracking and PPC Keyword tools. Choose your Project in the wizard window and a campaign if you’re exporting to the PPC Keyword tool. After the export is complete, you have the option to go directly to the tool of your choice and continue working with the exported keywords there. What do you think about this feature? If you have any ideas on how to further develop the tool, please share them with us at [email protected]. Thank you for making us better!